When you want a fun, family-sized RV, fifth-wheel, or travel trailer, the best way to find the right RV make and model for your needs is to browse through the biggest selection, and if you want a big selection, America Choice RV has got it. Here at America Choice RV, we’re proud to be the premier Florida RV dealership in Summerfield, Ocala, Bushnell, and Zephyrhills as well as for the rest of the country. We have a huge selection of excellent RVs for sale in-store or online, so even if you’re not located in Florida, you can still have the motor home of your dreams! 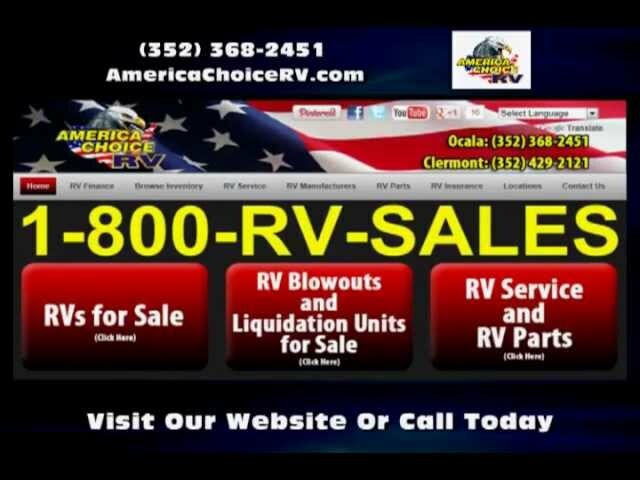 America Choice RV is the preferred dealership for Class A, B, and C motorhomes, fifth-wheel trailers, Travel trailers, and toy haulers in Florida and the US because we offer hundreds of premium makes and models for your to choose from. Our centrally located FL RV dealerships in Summerfield, Ocala, Bushnell and Zephyrhills make it easy for Florida shoppers to browse our inventory of new and pre-owned travel trailers and RVs in person, and our easy-to-navigate website makes shopping for an RV online a breeze from anywhere else in the country. We have great selections of new RVs for sale from your favorite RV manufacturers, and our constantly changing pre-owned RV inventory ensures we carry a wide variety of RV brands for you.